Naked is the perfect word that sums up Natasha Khan’s latest release, The Haunted Man. You rarely find album covers that represent the theme of an album but on The Haunted Man, Khan (known artistically as Bat for Lashes) is stripped of her clothes and makeup and shown supporting a man, just as naked, on her shoulders. This is the perfect representation of the literal “nakedness” of the album as Khan steps out of her usual witch-like melodies heard in tracks like Fur and Gold‘s ‘Horse and I’ and Two Suns’ ‘Daniel’, and turns to simplicity– and in a way, electronic music. Opening track ‘Lilies’ is just the start to the ’emotional rollercoaster’ any listener will embark on. The pain in Khan’s voice is hauntingly evident as she bawls, “Thank God I’m Alive!” As her voice echoes, all you feel is alone and it’s a breathtaking moment that will make anyone fall in love with the beauty of Bat for Lashes. The Haunted Man continues with ‘All Your Gold’, the second single off the album. Welcoming the track with African-like drum patterns, Khan describes her battle with heartbreak and letting go, telling us how she wasn’t in love and was stripped of all her confidence as she goes on to say, “I have nothing left of my gold”. ‘All Your Gold’ perfectly showcases Khan’s masterful storytelling skills. Her lyrical ability to transform songs that can be so easily dismissed as ‘cliché’ into something of such pure brilliance is enough alone to justify her recognition in the music scene. Khan’s textural vocals are celebrated in ‘Laura’, the most minimalist track in the Bat for Lashes repertoire. Khan definitely underestimates her vocal ability as she sings about a friend who she reassures is “more than a superstar”. The song is no gimmicks– just Khan’s vocals against an enchanting piano melody. ‘A Wall’ and ‘Rest Your Head’ show the obvious influence of electronic music has effected Khan, the deep bass drowns her vocals, swallowing the airy ambience that has so far shaped the album from track #1 to #8. The Haunted Man, as a whole, is a tad overproduced. Unnecessary effects are used in tracks like ‘Oh Yeah’ and ‘The Haunted Man’ and the percussion on all of the tracks sound almost ‘cheap’ – something that a bedroom musician is fully capable of. For someone with the lyrical prowess of Khan, overproduction is the only factor anchoring her. If anything was to redeem this overproduction though, it is the closing track. Returning to the minimal-esque direction where all that echoes is Khan’s haunting vocals, ‘Deep Sea Diver’ is the perfect way to end off a fantastic album. Is “fantastic” is enough though? 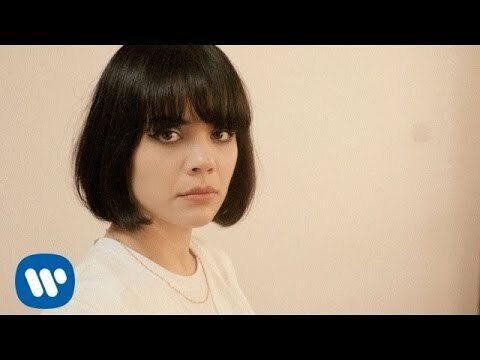 Bat for Lashes is capable of more; she just needs to do is to realize that her most powerful songs are her simplest before she will be able to take her music and storytelling to a whole new level.